Come to the Space Place at the Carter Observatory for a puppet show that travels from New Zealand all the way to the Moon! This is an epic tale of loss, longing and finding the way back home told with absolutely NO spoken word but instead uses Masks, Puppetry, lots of Cloth and plenty of Wonder. Incorporating breath-taking original Music by Wellington Composer, David Sanders, this is a puppet show for everyone age 5 to 95 years! Maori believe that seeing just one Kōtuku/White Heron in your life will bring you good fortune – but what if you came down to Earth from the Moon and got yourself captured by a cantankerous old Kōtuku who kept you as her prisoner and made you her servant? How could this possibly be seen as ‘good fortune’ – unless of course your adventure turns out better than expected and some really cool stuff happens on the way! Nominated for ‘BEST THEATRE’ and ‘BEST DESIGN’ at Dunedin Fringe, 2017 and Finalist for ‘BEST VISITING THEATRE’ at Dunedin Theatre Awards 2017 for their previous show ‘Kokako’s Song’, Birdlife Productions are back with a story that has grown out of their love of myths and fairy tales and was shaped and inspired by the New Zealand landscape - its light and colours and bird life. 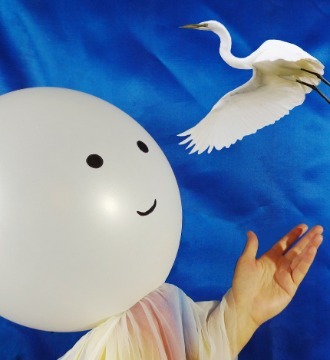 They use Basal masks and many different forms of puppetry alongside their hall mark low-tech/handmade aesthetic, this work crosses boundaries of language and culture, where stories and ideas are communicated without spoken word, but instead through visual imagery and the power of music.